Where you want your certificate sent. Deciding how to make a meaningful difference to fight climate change can be overwhelming. 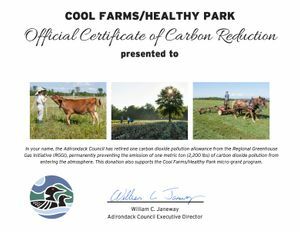 Through our Cool Farms/Healthy Park Micro-Grants program, you can reduce global carbon emissions, help to sustain Adirondack farms with grants and limit the local and global impacts of climate change. 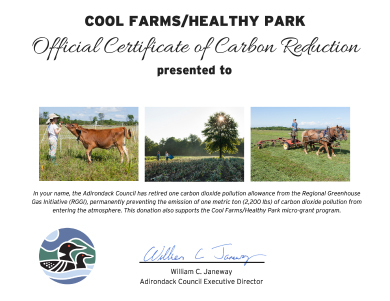 For a tax-deductible donation of $25 the Adirondack Council will obtain and retire one carbon allowance from the Regional Greenhouse Gas Initiative (RGGI). The proceeds of these certificate sales are used two ways: to buy more allowances and to help replenish the micro-grants fund. The Carbon Reduction Certificate (8.5 x 11) can be can be made out in the name(s) of whomever you wish. FREE SHIPPING ON ALL CERTIFICATES!